At Vermont Timber Works, we offer a broad selection of woods, typically ranging from douglas fir, hemlock and oak to pine, cedar and southern yellow pine, though we have also made frames in maple, cypress and Port Orford cedar. We are open to using other species too for the frame or accents, for instance, cherry and ash look great for pegs or splines. We will collaborate closely with you, ensuring that the wood we select matches your overall vision for your home, barn, church or business. Then we will discuss whether a smooth, semi sanded, rough sawn, or hand hewn finish will be most aligned with the look you want for your project. It is important to remember that all timber is susceptible to checking – natural cracks that appear as the timber dries out over time. Fir is an excellent wood for highly finished post & beam frames and commercial work because of its strength and beautiful grain. Its color ranges from light red to pale yellow. Hemlock is a great, economical wood for country homes and barns. It is pale in color and naturally richens over time. Pine is a very stable wood. 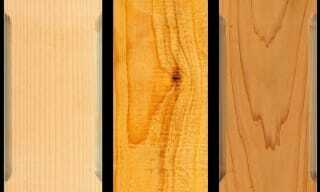 It has a good straight grain, can be easily stained, planes well, and is a great wood for hand hewing. Oak is a very strong & beautiful hardwood. 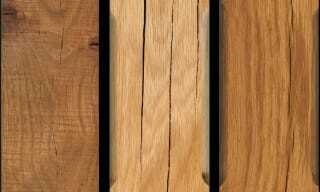 There are different types of oak: white, red, and mixed. 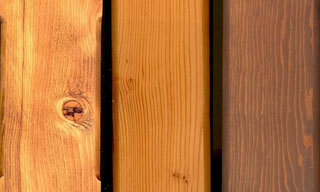 Cedar is a naturally white or red colored wood. It is also naturally rich in oils that preserve the wood when exposed to the weather, making it perfect for exterior use. There are different ways to texture timber. It can either be very smooth or rough or anywhere in-between. An example of a texture is Hand-Hewn, which is when the timber is cut with hand tools to create etching in the beams for a rustic look. More textures include: Rough-Hewn, Planed Smooth, Semi-Sanded, Rough-Sawn, & Weathered. 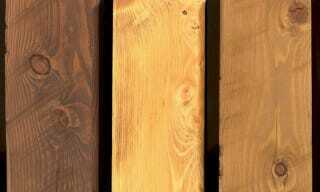 Timber is a natural product so natural variations in grain, color, and checking, are to be expected. Knots of various sizes are also to be expected. 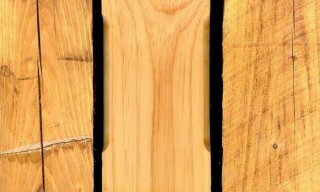 Shake is a timber defect. It occurs around the growth rings of a timber and is often found in older trees that grow in wet areas. Checking is cracking that develops along the radius of a log. The options are virtually endless. For instance, white pickled pine looks ideal in a bright and airy country home. Planed douglas fir is wonderful in elegant churches, hotels and restaurants. And hand hewn (or rough hewn) weathered hemlock is perfect in barns, community centers and ski lodges. We also use real antique beams reclaimed from old barns, which can add character to any space. There are many beautiful ways to stain each species of wood, as well, and beams can be colored with numerous hues that accentuate certain aspects of the building’s style, era, decor or scale. Every stain behaves differently depending on the species of wood and all woods have their own distinct look when freshly cut. 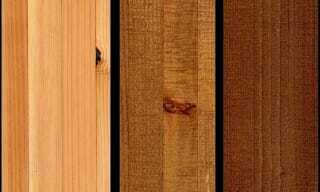 Douglas fir and cedar start out a light red hue, hemlock and pine are blond, whereas cypress ranges from very light to pale brown. We will send custom samples to you made with the exact species, finish and stain you choose for your project. To find out more about the wood varieties and broad range of finishes available, call us at (802)886-1917 or contact us online today. We promise an outstanding product, competitive bids, great customer service and attention to detail throughout the process.